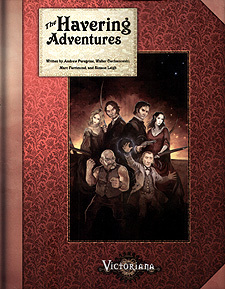 The Havering Adventures provides full statistics for the Haverings, for use either as player characters or NPCs, and three action-packed ready-to-play adventures showcasing the Haverings' unique talents. In "Lost Luggage", track down a rogue suitcase with some very unusual contents. In "Behold, the Valiant ones shall cry", take to the skies in a luxury airship brimming with intrigue and secrets. In "Dead Man's Hand", learn the secrets of a strange artefact being exchanged across the poker tables of London. The Havering Adventures also contains a wealth of detail on the Victoriana setting, including horse racing, the Royal Family, and poker. And remember, as Nathaniel Havering says, "It's not really gambling unless you have something to lose..."